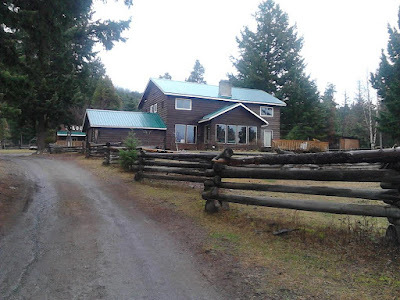 It was Thursday evening in November when I arrived at Chilcotin Holiday Guest Ranch. It was a long way to get here, because the ranch is really in the wild, but it was a nice trip. The road takes us next to high mountains and wonderful rivers. The sky was a clear blue and the sun was shining. Still when I arrived at the ranch it was a dark night, so I couldn’t see any of the nature around. So it would be best to go sleep and see everything in the morning! The next morning I get up at 6.30 am and go to the Ranch house for breakfast. There, I met all the other interns. It was very interesting to get to know where they are from, Australia, Columbia, Norway, France, Ireland and some other countries and as well as from Germany, like me! Everybody has been very friendly and helpful since the first moment we met. So, I have immediately felt fine. I’m also here to improve my English as well, so it is good that everybody has to speak English to communicate. After breakfast, they showed me the area around the Ranch house. There is the `Sheriffs office` where they do paperwork, phone calls and all the organizing. Behind the office there is the chicken house. Here there are more than 20 chickens, which run around the ranch all day, but they have to learn to lay enough eggs in the right place :-) Downhill is our apartments. We live all together, but most of the time, we are in the Ranch house where we are eating and sometimes having meetings in the beautiful living room with a chimney. In the Ranch house are also the kitchen and the rooms for the guests. On the map in the corridor, I can see how big the area is which belongs to the Ranch. Towards the Ranch house there is the horse barn, but there are only saddles and bridles for the horses, because all horses stay outside everyday in the pastures. In winter they stay close to the barn because they will get some hay! At the ranch there are 36 horses, which are available for riding. Because of the special workplace they are in a special kind of horse is needed, , the sure-footed Mountain-Cayuse from the the Cariboo-Chilcotin! I very excited to ride one of these horses, because the last time I rode a horse is more than ten years ago! My first few days at the Ranch were exciting and I am glad for the next three months I will be here. I think I can grow in my personality and learn a lot about Canadian nature and wilderness.